3. S-20C/ EN10213 1.0619/ ASTM-216-WCB. 2. 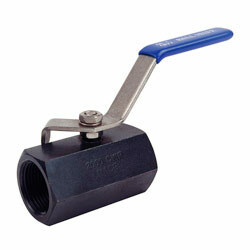 Features: (1) Threaded end. (2) Blow-out proof stem. (3) 2000psi/ 130bar. (4) 1-pc design. (5) Reduced port. 3. Option: V1H rating 1000psi/ 63bar, V1H polished surface.